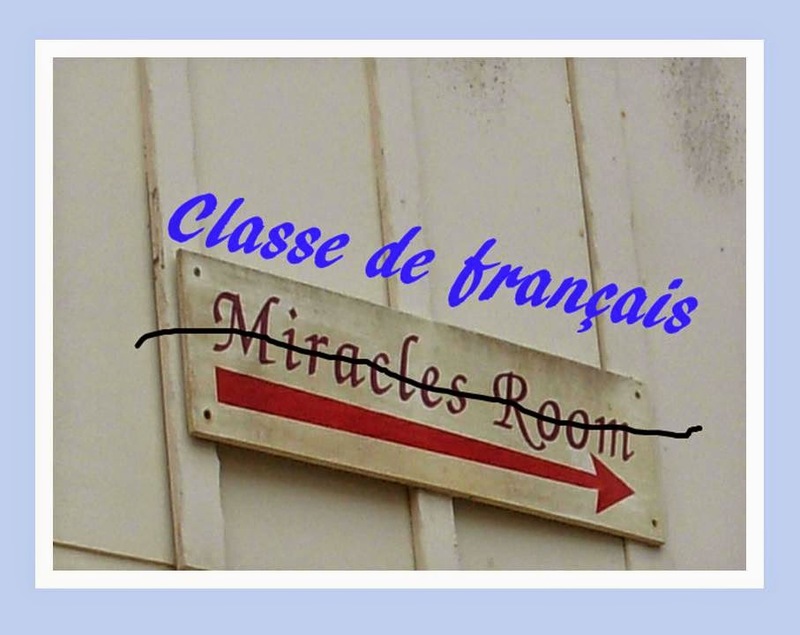 Teaching FSL: What's "Authentic" about tasks in French class? 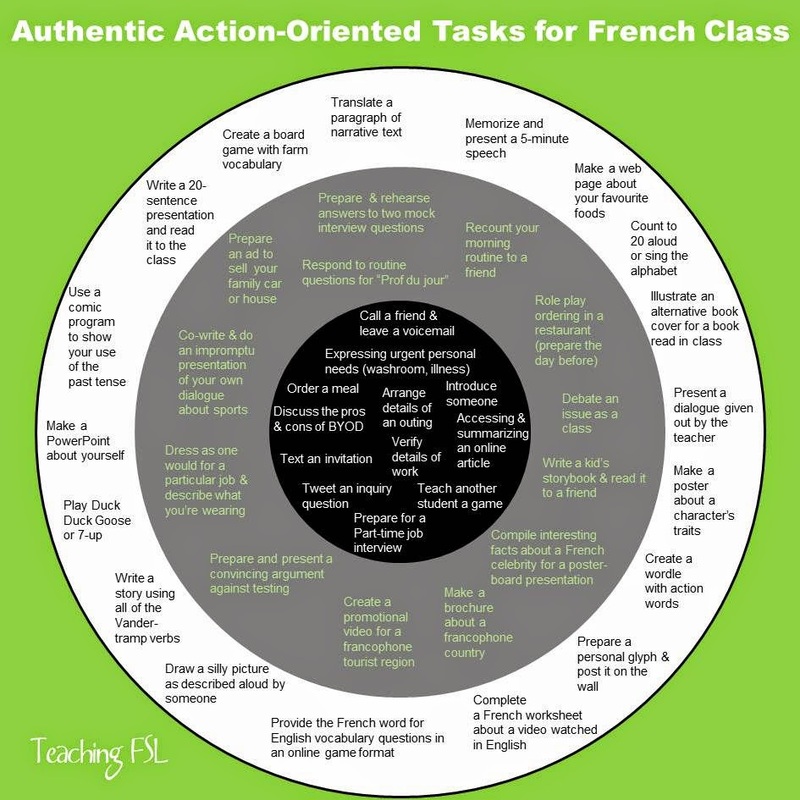 What's "Authentic" about tasks in French class? I've seen many teachers around me struggling to shift their thinking as it relates to having students perform authentic tasks in a second language class. Most clearly understand that having a student fill in a "Conjugate this verb" worksheet is not authentic, but beyond that, there are many shades of gray. I not an expert, but just an educator interested in supporting this conversation & further refinement by teachers as they find what will work best for their unique groups of learners. 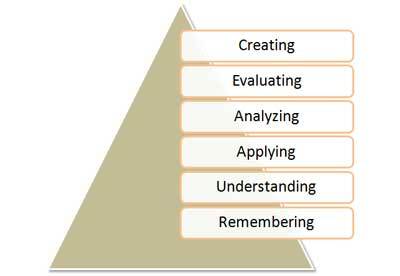 It seems important to start with a look at Higher Order Thinking skills. What are "HOTS"? (as I sometimes see them called in critical literacy, primary-junior circles) You already know what they are! They're the types of activities that ask our students to do deeper thinking. Think about those skills at the top of the hierarchy... evaluate, analyse, apply. Pay particular attention to APPLY for the FSL classroom. And now, about that need to have students work on "authentic tasks" together. Authentic means something a learner might actually do, now or in the near future, in the real world, in French. Given the opportunity, of course, through access to francophones with whom they could interact.... but let's just suppose a new francophone family appeared in your anglo community next week. How about "tasks"? We should be avoiding, to a great degree, the types of "tasks" that have sometimes existed in the Core French classroom in the past. Copying a note. Conjugating a verb. Repeating phrases after the teacher. Finding vocabulary words in a word search. Even larger projects that we assigned... things like making a promo video, writing a letter, creating a web page, ought to change quite a bit with the new curriculum. Our students could not accomplish these tasks in French. The reality was, the industrious ones spent a week or more glued to a French-English dictionary trying to accomplish some "project-oriented" goal. The not-so-motivated did nothing, except complaining "this is stupid; French is stupid" (because they FELT stupid when we asked them to do something that was way beyond their comfort zone). And those in between often did bits and pieces in French, but mostly wrote drafts in English... and then used Google translate to come up with final text they could colour and add images to in order to make it their own. How were they supposed to see the educational value in that? Now you're saying to yourself, "Ok, Mme Aiello, that's a fine bit of judging and nay-saying, but what really do you expect from us? We aren't miracle workers you know!" My response to your imaginary statement is two things: I'm not judging... I've been there and done that myself. But I'm also about ongoing learning, for adults as well as kids. The second part: Guess what? We just might be miracle workers. We do have a lot of control over how students view French, with our day to day choices and approach to teaching them! In no way am I suggesting that we throw the baby out with the bath water, and that the activities I've indicated have no pedagogical value. Some are great for scaffolding. All I'm saying is let's not stop there, and call that a summative task (assessment of learning). Let's help our students to feel confident and capable in the real world, one step at a time! I'm ready to take some flack over this... I'm working it out for myself too. So, please feel free to engage in professional dialogue in the Comments section below. Just please remain polite and constructive, to help us all to move forward. An authentic activity that I have enjoyed with the kids is to play a French song every week. I look for a variety of genres from francophone artists all over the country. This week, we're listening to Toi plus moi by Gregoire. We do a shared reading of the lyrics, underline the message of the song, look for verbs, nouns; we identify instruments and unknown words, etc....My goal is that the kids hear French music that is fun and different. So far, they're favorite is Pull Pastel by Les Trois Accords. I played it for them back in September, and they still ask for it today! I hope to see them continuing to enjoy this authentic aspect of the French language! Thanks for the detailed comment & check out "Chanson de dimanche" here on my blog if you need a little extra hand with some prepared materials one day. Isn't it such a great feeling when they truly enjoy French culture? I'll check out the song by Les Trois Accords. I don't think I know it! I love that you're exposing them to "real French music". I think that's so important too. I see underlining the message of the song as an academic activity. I'm not saying it's wrong to do that... and it definitely fits in with the curriculum, if you ask me! It could be part of "Listening for Meaning"... or possibly reading for meaning depending on how much of their ability to identify the message comes from their exposure to the song playing versus studying the printed lyrics. If you wanted to add another "authentic" element, what about something like just explaining what song is their favourite and why they like it? Or, if you feel like there has to be some kind of a constraint or obstacle, what if their task is to call a radio station and request the song they want to hear, but they can't remember the name or the singer? That would require them to describe the song, describe the voice or the music, maybe even sing a little part of it. I like having the students talk about what they are reading/have read. I do Cercles communautaires littéraires where they get to talk about their readings or get to ask questions to a classmate to get more information. It force them to think about their book, like identifying main idea, themes presented, character traits, anticipation of possible scenarios, etc. Those discussions stimulates great conversations,especially when some are reading the same book. Conversations are authentic. Is your organizer set up so that the best practices are in the centre of the target? That's what I'm getting from it but want to check in to see if that's what you intended. I completely agree with this post! I've been noticing since I started teaching 5 years ago, that FSL teachers still give "tasks" such as a research-that-French-city-project where kids make a powerpoint (or slides) presentation with large amounts of text they found on a website and plugged into Google translate, they stand in front of the class and read it out (usually not even understanding what they are reading). Once I even witnessed a kid who accidently translated a slide into Italian and read it as if it was French! And this passes for an oral communication assessment? Shocking. I believe kids need to learn how to use French to communicate needs, wants, and basic information that will help them in situations outside of the classroom. At times I question the authenticity of some of the activities I do with my students, with things like play performances or writing silly sentences and then drawing to show their comprehension. But then I remember that using recycled language helps to internalize sentence structures and that learning a familiar story as the basis for a variety of language activities and question types helps kids give context to new vocab or grammatical concepts. The part I love the most about teaching is that we have the opportunity to reflect and critique our practise and learn new ways to support 21st century learning. I think it's an important process to look at our teaching strategies critically and I love reading thoughts of other awesome educators like you! I just googled action oriented tasks are stupid, and this came up! LOL I guess I agree whole heartedly with your comment about looking everything up in english and translating it on google translate. NOT what I asked them to do, but here they are, doing it, to get the assignment done the only way they can. Well, Mme, thanks for the nudge and laugh. i enjoy your blog. We do what we can, and we must give our kids the vocab, the fluency and the ability. Some action oriented tasks are ridiculous. Of course, they are simply a springboard for ideas and we must adapt for our own use, knowing the kids and their abilities and interests.